Convenient – Includes extra durable disposal bags, super absorbant LabSorb granules and a convenient graduated scoop. Quick – Convert liquids to solids in seconds. Adaptable – Apply to any volume of liquid waste including 500 ml, 600 ml, 1L and 2L vessels. jar of LabSorb can absorb up to 50 litres of liquid. 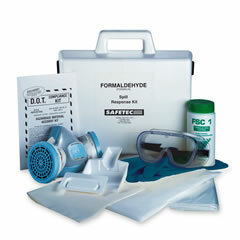 This kit features FSC-1™ to aid in reducing exposure to formaldehyde gas in the event of a spill. 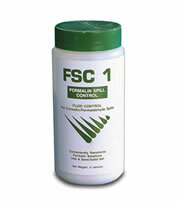 The formalin is transformed into an easily removable semi solid mass. The resulting mass cools rapidly to minimize formaldehyde off gassing. EMS Introduces Break-Safe™ allowing you to safely open up to 3 ampoules at one time. Box style design allows one handed opening of up to 3 ampules at a time. Gently pressing down on the lid snaps ampule necks clean while keeping them contained within the device and away from fingers. After removing ampule contents, simply turn the device upside down over a trash receptacle to safely discard ampules and tops. Reusable – Made from soft silicone. It offers a simple way to break pre-scored glass ampoules safely. Accommodates 5, 7, and 10 ml size ampoules. Reduces injury and spillage. A flexible polyethylene film backing which has a highly absorbent upper surface which traps water, dyes, resins, solvents, and radioactive solutions. The sheets can be rolled up and discarded after use. Ideal for daily use in EM labs. Benchtop mat comes in a roll 20" (50.8cm) wide and 50 ft. (15.2m) long in a dispenser carton, or a cut size of 20"x24" sheets. The tray is made from vacuum formed polystyrene 1/2"(12.7cm) deep with an external flange.The overall dimensions are 23"x27" (58x69cm). The tray accommodates our Benchtop mat (Cat. #64446). 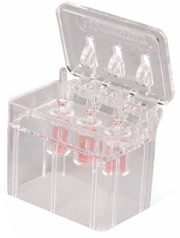 These trays are very useful in the biology or chemistry labs. For One-Handed Opening and Closing of Microtubes. Improve Efficiency – Ring design allows researcher to wear the TubePopper on the pipetting hand while pipetting. Finger Saving – "Pry open" design means tubes pop right open, saving your fingers from the repetitive stress of opening microtubes. Snag-Free – Bottom portion of TubePopper allows caps to be pressed closed without snagging glove fingers. Universal – Works with most flat-top and domed microtubes. 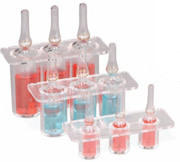 One Size Fits All – TubePopper can be worn on any finger so you can find the perfect pipetting fit. Vinyl coated lead rings which stabilize glassware that is immersed in water baths; reduces tilting and chemical spills. A soft lead sheet coated with Vikem vinyl has many uses for stabilizing laboratory equipment in water baths or any application where extra weight is needed. Small sheets are handy as a hold-down weight for note books, drawings or charts on the table top. Longer sheets may be bent into the shape of the glassware to keep them from sliding or tilting. Coated lead sheets are 0.085" (2.2mm) thick. This lead wire is ¼" (6.4mm) in diameter and is coated with a chemical-resistant red Vikem vinyl. Its 12" (300mm) length and its flexibility make it a very versatile weight. It can be coiled around a flask, beaker, or any other irregular shape. It weighs only ¼ lb (114g). This weighted holder grips the beaker or flask firmly in four flared stainless steel prongs. The Vikem® vinyl-coated lead ring secured beneath the beaker keeps it immersed in water, providing a low center of gravity which allows water to circulate underneath the beaker. One adjustable clamp that accepts 125, 250 and 500 ml flasks. Magnetically attaches to shakers or incubator-shakers. * The patented design allows the user to simply rotate the lever to choose their desired size/position.